If anyone in this world knows what the West is doing, its Vladimir Putin. The Russians are no strangers to scientifically vectored propaganda. They have studied it and mastered it. When President Putin receives his daily briefing, his advisers have analyzed the propaganda and indicated its purpose. 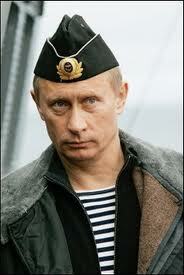 The Russian leader is fully aware that Obama & Company cannot fight a war in a Muslim country again. The costs have been staggering both in Afghanistan and Iraq. If one adds the costs of involvement in Somalia and Libya, the numbers become much more forbidding. But this has not prevented the U.S. government from involving itself deeply in Syria without putting anything but a few boots inside the country. There are many more American boots, as you know, in Turkey. The Russian analysis of the situation is that President Assad will survive this crisis but at a terrible cost. Russian assessments of his army’s morale are very encouraging. Over 95% of the Syrian officer corps is professional and profoundly loyal. In terms of desertions, the numbers are quite small. The Turks keep announcing the arrival of this general or that, but the 30 or so high-ranking officers have turned out to be non-active; i.e. retired former generals with no command. SyrPer also believes that most Turkish announcements have been made dishonestly and in obedience to the CIA’s propaganda war directives. The Turks have deliberately concealed the names of these so-called defectors because they would be immediately declared “unimportant” or “irrelevant”. And the list goes on and on. What they don’t tell the deserters and terrorists is that the Russian government will not permit the fall of the Assad administration. Talk of negotiations with the opposition is fine and dandy, but it is always with the understanding that Dr. Assad is the president of the republic. They also won’t tell them that Russia is planning a huge military airlift to block any assistance from countries such as Turkey. He looks like he’s ready for shore leave in Tartous. Don’t ever underestimate this former spy. He knows the West and how to deal with it. He has made the decision that the West cannot win in Syria. He has told President Assad this. Russia is on board with Iran. President Putin has assurances that Iran will “leave no stone unturned” in defending Syria’s government. This information has been passed on to all high-ranking officers. What the West has been trying to do by direct cellphone contact with army officers is convince them that Assad is doomed. But officers know that that cannot be right when they have been told Russia will not allow any such eventuality. They are fighting with the knowledge that a superpower is behind them, all the way. Also, the U.S. has become a laughing-stock among minority officers who are more committed than President Assad to the survival of the government. Russia now knows that an effort to unseat President Assad will bring on a confrontation. And this is one Moscow does not intend to lose. Syria’s most urgent problem today is not the insurgency. When compared to the crisis in Iraq, the Syrian situation pales. But Iraq has lots of oil; whether to produce and sell or to mortgage for loan. Syria has only a little oil (200,000 bbls per day) and some agricultural products. President Assad discharged all Syria’s debts in 2006 and the country was literally debt-free until this insurgency started. Money is now the name of the game. The West thinks erroneously that Syria will buckle under the economic strains of sanctions and expenditures. Russia has already planned for this. Iran has over 150 billion dollars in foreign reserves. Russia and China are both flush with cash and are willing to use some of it to establish norms in foreign policy. If Syria is allowed to fall, the West will have won again as in Libya. Both China and Russia are not going to allow this to happen which is why China votes along with Russia with the same regularity Clarence Thomas votes with Antonin Scalia. There is a meeting of the minds on this issue. But Syria had 48 billion dollars in foreign reserves and gold before the crisis. SyrPer estimates that half of that is still available. Yet, we know that Syria has asked Russia for an additional amount as a stopgap. Russia will find the resources to grant the request. 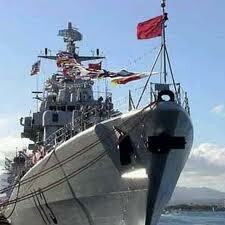 This Chinese battleship passed the Suez Canal on July 28, 2012 and headed straight for Tartous. Naval maneuvers with Russian, Syrian and Iranian warships are to begin anon. Nobody tells the terrorists this is going on. It might be demoralizing. Russian news media tells the world a different story about Syria. But the terrorists speak only the languages of terrorism today: English and French. That’s too bad because alot of the deserters and criminals could get a new lease on life if they just put two and two together. Namely, that Russia, Iran and China are not going to allow them to win. It’s as simple as that. We at SyrPer are hoping that Dr. Assad will use any new funds to establish a propaganda machine like no other. We need a Radio Free Turkey to beam reports in Arabic and Turkish to enlighten people about what this Islamist snake oil salesman, Erdoghan, is doing. Broadcasting in Turkish to the Alevi and Alawi populations might have the desired effect of getting these large minorities to start acting up. There is a chance here for a possible alliance with the PKK. Which brings us to another necessary act: arm the PKK with anti-aircraft weapons. This will put an end to Turkish Airlines for the near future. I mean, who would get on TA knowing that a PKK operative might have gotten a Strela (SAM 9) across Turkey’s porous border and shunted it to Istambul? That would be a kicker for Erdoghan. Imagine that! Goodbye tourism. Hello, terrorism. It doesn’t look like much when fired at a F-16 or MiG31, but it’s a real humdinger when it comes to commercial aviation. 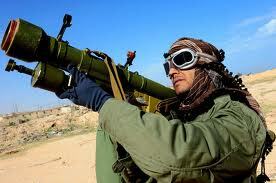 Wouldn’t it be great when American-supplied anti-aircraft missiles wind up with Al–Qaeda in Europe? Russia would lose too much if it abandoned Syria. With a president in power who envisions a revitalized Mother Russia with global reach, Moscow cannot allow us to fall into the hands of American-sponsored Islamist terrorists. Spaceba.